Last Spring we brought home fifteen chicks from the feed store. It was our first time owning chickens, and we didn’t even have our coop built yet. The coop went up as the chicks grew out of their box in our spare room, then grew out of the brooder box in our garage, then when they were about to grow out of the dog kennel in our yard the coop was ready (tip: build your coop BEFORE you bring home chickens!). This past year has been a huge learning experience for all of us. I’ve learned that if you don’t want slugs in your yard let your chickens free-range wherever they like…but this may include your back porch which means that when you walk out your backdoor you’ll have to tip toe around the chicken poop all over your deck. I’ve learned that having two roosters in my flock hasn’t been the horrible debacle that I was told it would be. But I’ve also learned that having ANY roosters in my flock means that my small children may at times need to be armed with a long stick when they go outside to shoo the roosters away. I’ve learned that chickens are amazingly entertaining. Much more than I ever anticipated. Have you seen a chicken run? Most importantly I have learned that no store bought egg can compare to the beauties I collect out of our coop. I had never seen a yolk such a deep orange before I cracked open our chicken’s first eggs. Pale yellow yolks are just sad. 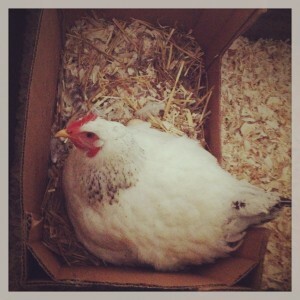 Just over a month ago I realized that one of our chickens had gone broody, meaning she wanted to hatch eggs. Since we have roosters I knew most, if not all, of the eggs would be fertile. 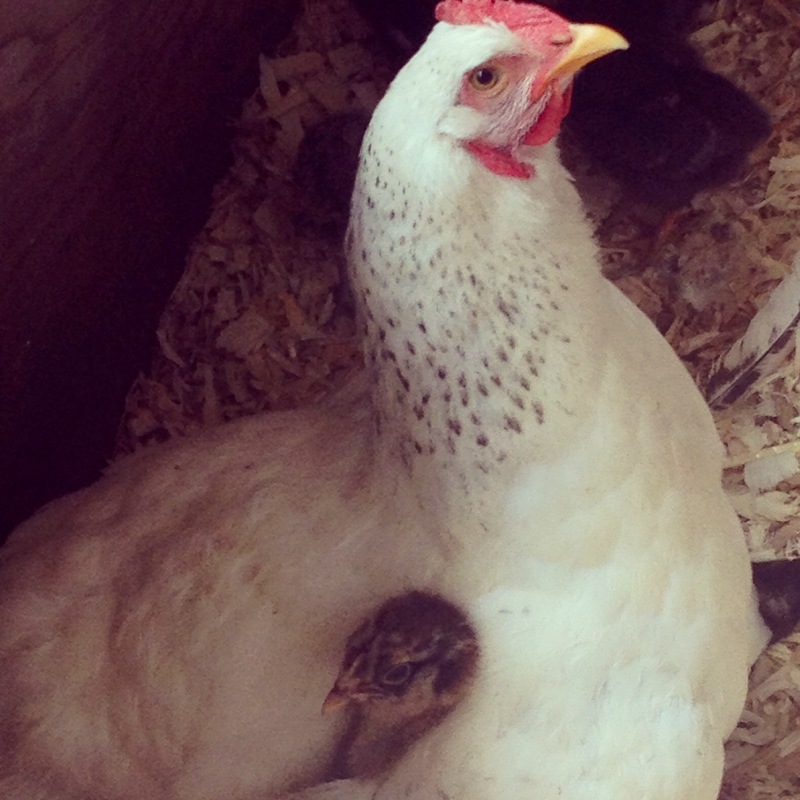 I had already considered adding more chickens to our flock so I decided to allow her to live out her dreams and become a mother. It takes just 21 days for eggs to hatch. We lost some eggs along the way because the other hens wanted to lay their eggs in the nest the broody hen was in and all the foot traffic caused some eggs to crack. I marked the eggs that I was letting her keep and would remove the others each day. Several days before Hatch Day I moved the broody hen into the brooder box in our garage so she could have some peace and hatch her babies away from the other chickens. I candled the eggs on day 19 to make sure they were all still viable. Candling means holding a flashlight under the bottom of an egg to see the shadow of the chick inside. My kids loved seeing the chicks wiggle around inside the shells (so did I). On the evening of day 20 I checked on the eggs again and found that one of them had started to pip, or peck through the shell. Oh, the excitement! I was like a nervous father pacing around that poor hen, and she certainly let me know I was being obnoxious. I went to bed reluctantly and in the morning when I checked in on them there was a freshly hatched chick! As day 21 rolled (slooooowly) on, more chicks hatched. Our last baby hatched on day 22, the smallest chick out of the bunch. Six eggs in total hatched. There will most likely be some boys out of our six home-hatched chicks, so a couple of days before Hatch Day I purchased a few chicks from a feed store giving me a better chance of having more girls (I’ll keep the girls, not the boys). 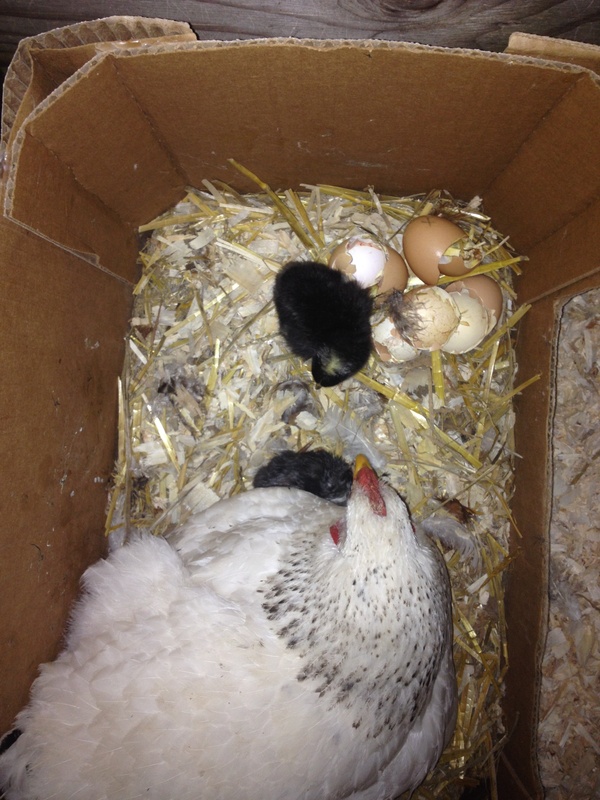 On day 24 I put the feed store chicks under the hen with her babies, in an attempt to “graph” them to the family. I was nervous because I had been told that the hen may not accept chicks that weren’t from her clutch, but our hen welcomed the new chicks with open wings. She is an exceptional mother. I take them all out into the dog kennel when the weather is nice so they can have outdoor time. The babies took their first dirt bath the other day and I about died, it was just too much cuteness for me to handle. Having chickens is pretty easy, and you get the benefit of fresh, nutritious eggs. I know urban chicken-keeping has become pretty popular, but some people are not sure what to do with their chickens once their egg production decreases or stops. Chicken soup comes to my mind, but not everyone may feel the same way. So if you’ve considered adding chickens to your backyard, make sure to first consider what you will do with a chicken who stops producing eggs. If chicken soup isn’t on the menu, then you could find a farm willing to take older chickens, or you could always keep them as pets. A chicken’s lifespan is 8-15 years…that’s a lot of years of clucking and scratching and general chicken shenanigans to enjoy.